What Kind of Art Is the Videogame? Sony Computer Entertainment, 2005, 2011, 2018. Can videogames be art? This question plunges one immediately into the pitched battle about the definition of art. Perhaps some particular feature of a definition might exclude videogames in principle: Roger Ebert once said that “Art seeks to lead you to an inevitable conclusion, not a smorgasbord of choices,” which rules out nonlinear videogames immediately, along with interactive theatre and various forms of traditional storytelling. These cut to the heart of the games-as-art debate, because of course there are a number of ways in which videogames might be worthwhile pursuits. One is that they are entertaining, fun, diverting—a nice, harmless way to switch off (Tetris, some mobile games). Or they can be games in the sense that both chess and tiddlywinks are (StarCraft or Mario Kart). These, though, are not the senses of “worthwhile” I’m interested in. I think videogames can be valuable and worthwhile as stories, as aesthetic experiences, as beautiful things, as art. But the value of videogames is often obscured by an unwillingness to make the kind of distinctions that we make about books and films—distinctions of genre and narrative ambition as well as quality. Unfortunately, it’s not just that games-aren’t-art people don’t make these distinctions. Sometimes the way people who play, make, and review games talk about them makes it harder for others to appreciate, and helps perpetuate popular myths about the medium. What are those myths? The first and perhaps most important is that videogames are shallow, that the stories they tell are trite or at best simplistic. This is flatly wrong. Videogame narratives have come a long way since Mario’s princess was in another castle: creating complex characters and dealing with themes like the social isolation that relativism can generate (The World Ends with You), the power and limitations of pacifism (Undertale), and growing from childhood to adulthood (The Legend of Zelda: Ocarina of Time—Robby Soave writes about it for Reason here). They have created countless wonderful characters. What’s more, videogames offer unique storytelling possibilities because of their interactivity and capacity for immersion. Having to actually solve the mysteries makes a noir-ish detective story like Hotel Dusk different from its counterparts in literature or cinema: not better, but it provides a way of experiencing the tale that’s impossible in any other medium. This War of Mine places the player in the shoes of civilians trying to survive a war zone, while Spec Ops: The Line places them in those of some of the soldiers who perpetuate their suffering. Both serve as quite devastating deconstructions of the glorification of violence that characterizes a lot of first-person “shooter” games (and action movies). That state of mind has been called “willing suspension of disbelief.” But this does not seem to me a good description of what happens. What really happens is that the story-maker proves a successful “sub-creator.” He makes a Secondary World which your mind can enter. Inside it, what he relates is “true”: it accords with the laws of that world. You therefore believe it, while you are, as it were, inside. The moment disbelief arises, the spell is broken; the magic, or rather art, has failed. Tolkien thought of the ability to “sub-create” as an aspect of the imago dei, a quintessentially human activity. It’s my contention that the storymakers making videogames have sub-created magnificent secondary worlds. Among the finest is Fumito Ueda’s Shadow of the Colossus, first released in 2006 and recently re-released. The world is vast, beautiful, and almost completely empty of life, other than the Colossi and the occasional bird or lizard. Your only companion is your horse, your only equipment a sword and a bow. Its colors are bleached-out browns and greens that glow with an inner light. There are human-made structures in various states of ruin. Something happened here, but you get very little explanation about what it was: your best clues are the environments themselves. The game’s atmosphere is quiet, contemplative, melancholy. You spend most of your time navigating the landscape to find the Colossi, and when you do discover them they are awe-inspiring—towering, majestic organic monuments hundreds of meters tall that both resemble real creatures and feel utterly alien. The Wanderer is not an ubermensch: he’s fragile and easily shaken off the beast he’s trying to scale. 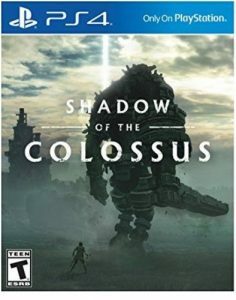 Figuring out how to defeat each Colossus becomes a tremendous accomplishment but instils a deep sense of unease at having ended the life of something beautiful (a tension echoed in the game’s fantastic soundtrack). The way the story plays out gradually reveals the connection among Dormin, the Colossi, and the reason the land is forbidden, and the bittersweet result of the Wanderer’s bargain has stayed with me for years. But one of the most moving things about the game is the connection I forged with my trusty horse over the sixteen or so hours gameplay lasts. All this is accomplished with a handful of spoken lines. Other games, like Journey and Metroid Prime, forgo dialogue altogether, leaving you to piece their tale together through exploration alone. The point is not that these stories are by virtue of their interactivity better than the best of other mediums. The point is that they are wonderful stories that can only be told through their medium. It is no accident that videogame-to-film adaptations are rarely successful. Much of the exploration and puzzle-solving that characterizes Shadow would not succeed if merely depicted or described. But when performed by the player, these tasks flesh out the secondary world. Playing as the Wanderer in his battles with the Colossi, you feel his desperation every time his fragile body barely clings on to their fur. To return to Ebert’s objection, it’s worth noting that the fact that a game is interactive does not automatically mean that its story is non-linear. In Shadow of the Colossus, the Wanderer cannot complete his quest without killing the Colossi. You’re not presented with Ebert’s “smorgasbord of choices”: you inhabit the Wanderer on his journey and control how he makes his way through the world, but his quest can’t be abandoned without abandoning the game. Other games that involve conflict, like Deus Ex and Undertale, allow you to make your way through the story violently or nonviolently, with the game’s world changing in response to your choices. Each path, of course, is still ultimately crafted by the game’s creators, but that one game can tell more than one story need not diminish the impact of any one of those stories. The way choices work often confuses people unfamiliar with narrative videogames and leads to another popular perception: that there is something essentially artificial about playing a videogame. It’s true that the fact that different games allow you different degrees of freedom can be strange, and the ability to change some things but not others can be alienating if poorly handled. “Why can I do this, but not that?” is a question that breaks the immersion and snaps your mind out of the secondary world. But it’s not a question that people who play videogames tend to even think about, because we’re used to what can be called the “language” of games: the cues that in a well-crafted game tell you what is and isn’t possible: the rules of the world. So why haven’t videogames followed film and television into the realm of artistic respectability? It’s true that most videogames are not art. Yearly entries in the Call of Duty franchise and mindless hack ’n’ slash titles sell millions every year. And the great strength of videogames—their capacity for immersion—can also lend a layer of addictive appeal to ultimately empty, banal, or morally degrading games. But most books and movies are not great art. We do not think that the existence of The Purge somehow invalidates Schindler’s List, or that Nicholas Sparks novels have anything to do with the merits of Anna Karenina. The truth is that videogame critics—in both senses of the word—often fail to make the necessary distinctions of genre and ambition as well as execution. Those who don’t think videogames are art, and those who review them for a living, often make the same mistake. Videogame criticism has not yet decided what it wants to reward most in games. Just last year, IGN—one of the most high-profile videogame review websites—dubbed the 1990 SNES title Super Mario World the greatest game of all time, in a top-100 list that put Shadow of the Colossus at 28. Certainly Mario World is fun, and the two-dimensional, run-and-jump adventure captures a certain sense of simple, childlike joy. But praising it as the greatest work that videogames have produced only justifies others in not taking the medium seriously. Die Hard is a perfectly executed example of its genre, but no-one would call it the greatest film of all time. Worse still, when sadistic, morally bankrupt games—and let’s be real, that’s most of the Grand Theft Autos—are not just well-reviewed, but consistently acclaimed, it makes a medium capable of great beauty seem not just trivial but ugly. Videogame criticism is, I think, moving to a better place, but it is not yet there. I look forward to the day when games are taken as seriously as other forms of narrative art because I want more people to play the games that have moved me. I want people to experience secondary worlds like the Forbidden Land, and to grow to love the characters that inhabit them. The sooner both those skeptical of videogames and those that love them consistently make distinctions not just of craftsmanship and execution, but of genre and artistic merit, the sooner that day will come. Ben Conroy is currently pursuing an MA in Philosophy at University College Dublin, and writes the “Everyday Philosophy” column for The Irish Catholic newspaper. He studied philosophy, politics, and economics at Oxford.